A collection deserves to be catalogued for a number of reasons but mostly for the ease of tracking your albums and insuring your collection. No matter what tool you use — discogs ftw — start early and keep up-to-date as you buy/add new albums to your shelves. The catalogue becomes even more important when moving if you plan to make sure that everything you box up winds up in your new home. A memory can keep track of only so many things before it beings to fail but a spreadsheet or database is the best piece of mind you can have. Phoenix collectors know all too well that our desert can warp a record faster than a needle drop so when it came down to considering transporting this collection just as temperatures were rising, timing was very important. An early morning timeframe was chosen as temperatures peak in late afternoon and though the sun rises very early, the urban heat island of Downtown Phoenix is still somewhat reasonable temperate from 5 a.m. to 9 a.m. In this case, renting a truck with an air conditioned cab was not necessary considering the proximity of the new home for the collection, but most moves are not down the street. Whether it be a professional moving service or doing it DIY with a U-haul truck, check local forecasts and select an optimal date and time of day to transport your collection to eliminate as many severe weather factors as possible. It sounds deceptively simple but the fact is most people do it wrong. Damaged albums happen mostly because of improper prepping before they even make it into a box and onto a truck so take a couple of precautions to ensure everything stays minty. Stock up on outer sleeves if you aren’t using them already. These keep albums from rubbing against each other resulting in wear to the jackets which is usually something that can’t be fixed. Now is also a perfect time to upgrade all inner sleeves to a poly sleeve as removing the discs from the covers is the next step. Place each disc behind the jacket to avoid ring wear and the dreaded seam split. U-haul boxes have been a favorite of collectors and stores because they’re cheap, sturdy and U-haul will buy back any unused boxes back at full cost. The small box fits records perfectly with enough room for some padding on each end. Depending on how each box is packed, they comfortably fit between 60-80 albums, though some people do claim upwards of a 100/box but that’s not recommended. A metafilter article mentions using a box with a much higher price point but the benefits may outweigh the increased cost for those long hauls. With double wall construction and a focus on durability, the 12” Record Storage boxes from Bags Unlimited stood up to one users move but at about $28 for just two boxes and no buy back offer, not many budgets can warrant the expenditure. When it comes to tape, make no mistake, U-haul’s Packaging Paper Tape held together 30 boxes so well that post move-in, breaking down the boxes could not be done by hand. The paper tape is very durable, meant to accommodate heavier packages and won’t yellow or become brittle like some of the clear adhesive tapes that are more common. Record distributors even rely on this or similar tapes and based on the orders received in the mail over the years, this stuff works. The last provision needed is bubble wrap, or an alternative cushioning material for the ends of each box just to help keep them from jostling around too much. An important consideration here is how far the boxed records will need to be carried. Short distances with no stairs? Heavier boxes may be alright but if you have a long distance to travel with each box in hand, deliberately under-packing them will save your back. Hand trucks or assistive devices will make even more of a difference, so rent one if possible. Hopefully the collection is in order so maintain that when packing by working backwards genre by genre. Label everything, take pictures if needed or assign it a bin/shelf number so that when the collection is delivered, the destination of the albums in each box are predetermined. Stacking boxes of records is a-okay but done unevenly or in a sloppy fashion will probably result in a delivery of toppled boxes in some state of disarray. Records are heavy, the weight of each box is concentrated in the middle similar to a shelf of books; stack too high and the boxes on the bottom may get squished. The Tetris-like process will test any collector’s resolve to the format. The process is all about fitting squares and rectangles into the most efficiently organized and packaged fleet of albums ready to move. 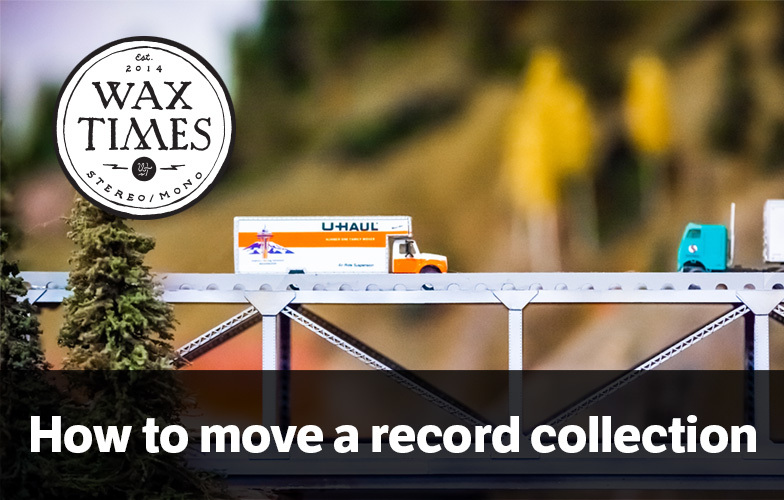 Just as the breaking point approaches, where not a single record will fit into another box or the number of boxes have exceeded expectations, relax and if possible spin a favorite just to remind yourself of why you have records and what it means to be a collector.